Whether his CD's or vinyl tracks are played independently or blended in a DJ set, a Richie Hawtin tune is always distinguishable from the maelstrom of other electronic producers. His tracks are known for their distinct atmosphere, their austere sparseness and a nearly obsessive drive for perfection. The fact that he is a world-renown producer can be attributed to many factors. Among them; a timelessness that makes even early material as relevant as the date of release; the fact that he embraces technological innovation and change, he directly involves himself with the live venue production of his work and the obvious satisfaction he derives from making music. I had the opportunity to speak with Hawtin over the phone in August during the European leg of his world tour. At the time he was promoting his latest effort, DE9:Closer to the Edit where he extracts over 300 samples from over a hundred minimal techno recordings and reassembled a tech-house set with experimental software such as "Final Scratch," the more established Electrix Repeater and his trusty 909. Hawtin elaborated on his production software and the concepts behind his latest release. Hawtin: "I think Final Scratch is really a revolution for DJ's, it enables all of us to interact with vinyl and turntables in exactly the same way we have for so many years. Instead of controlling just music on vinyl, we're actually controlling digital files, once you start having this physical interface into the digital world I think we're just starting to scratch the surface of it's potential. So all those things that I normally do as a DJ, cue-up or back-spin or play records fast or slow in reverse--all those things are now transposed on to a digital music file and you get to hear all those transformations. Using a device like this and the (Electrix) Repeater enables me to sample loops and bits and pieces of records and re-sequence and rearrange things. There has to be new ways of mixing and matching people's recorded material and information in general. I'm a person who uses technology as his tool and I filter and rearrange and manipulate digital information. I've taken the 1's and 0's of other people's ideas and re-edited them, changed the sequence and put it back together in a completely different form. I think that starts to question what is an artist's job, when does someone else's work become new and relevant to someone else? When does copyright end and begin? There's a lot of things with the internet, digital distribution and digital transfer of files that starts to re-evaluate the way we think." A glance over the track credits for DE9 reveals that Hawtin has chosen to work with more underground tracks such as music by Lowtec, Sutekh and Studio 1, tracks that only the techno DJ savvy would know of. Hawtin: "I didn't want to use music everybody knew, Jeff Mills and a lot of bigger names because I wanted to use the CD to bring exposure to some of the new and upcoming people but also use tracks that I thought were really good and give it a different twist, say 'it was good that way but this is my take on it, my interpretation'." 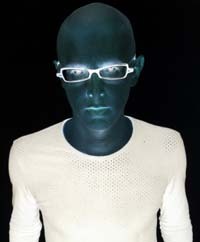 Hawtin has earned a reputation for music production under various alias' including 'States of Mind,' FUSE and the more well known Plastikman. From the robotic whine in "Plasticity" and "Plasticine" accompanied by sharp rhythms as the synth lines increase in urgency becoming more dogmatic to the sharp, overwhelming staccato of "Spaz" and "Spastik" that builds to a frenzied peak; to the more brooding atmospheric realm of his Artifakts series with pieces like "Psyk" and "Rekall" which brings down the microscope closer to the science of composition and rhythm structure. All his tracks share a minimal, starkness yet Hawtin manages to extract the most from the least expressing this through an antiseptic futurist sensibility. In fact, Hawtin's critics complain that his tracks are too clean, stripped away of their sweat and humanity, devoid of any organic warmth. Like it or not, Hawtin has developed his signature style. It is for those reasons that Hawtin is a favorite among club DJ's who want to 'sober-up' the crowd and make them aware of their listening environment. The changes in pitch and timbre and his mind altering panning techniques have always left a strong impression on the listener. Because he is a club favorite I asked if he made his tracks specifically for that purpose. Hawtin: "I've never approached my tracks as just DJ tools, I think there are a lot of tracks that are basically a loop and 'that's it' and the DJ does the work. I've always wanted DJ's to work my music, but I've wanted my music to work itself and have a beginning, a middle and an ending. To have a 'build-up', 'ups' and 'downs'; not just a stripped continuity of repetitive ideas." While I would make dark futurist word associations with Hawtin's music the man himself generally prefers the psychological dysfunction motif as exemplified in titles like "Spaz," "Skizofenik," "Panikattack" and "Hypokondriak". Hawtin: "A lot of the ideas of Plastikman were trying to play with people's minds during listening or participation of events where I was trying to create something that people had never experienced before. So that really gets into the idea of playing with the idea of what's real and what's unreal and starts to get into the whole idea of the mind, of insanity, of what's physical and what's not. Playing with people's perceptions like "Panikattack," building up momentum, building up tension and dropping things down." Electronic music tracks tend to be dated within a short span of time, often in accordance with the latest gear or software development. Despite innovations in technology, Hawtin's tracks are still classics, enduring in the face of change. Did he consciously attempt to create a classic with each release? Hawtin: "I don't think you can approach music or art trying to create a classic. Classics not only outlive the author but also mark a specific moment in time and are relevant to the state or situation that a person was in. I'm trying to create works that are progressive and in the leading edge of what's going on and really relate to that specific moment in time when they're recorded and how things are changing and evolving. Whether that makes them relevant or classics in ten years or a hundred years, I don't know, I'm not worried about that, I'm worried if anything, about progressing electronic music, progressing my own ideas and visiting places that I've never visited before within my work." Though the reactions to Hawtin's music have remained consistent, the electronic music scene has gone through several changes over the years. From events held in once obscure warehouses to official concert hall venues, his shows now tend to be on the over-produced meticulously managed side as opposed to the fresh spontaneity and energy of the early Rave Scene days. Hawtin: "It's a natural progression, things couldn't be underground or in dirty old warehouses forever. It's a bit of a challenge to take things into these pre-established venues and legal venues and work within that infrastructure to create something interesting and different. It's not only the venues but also the perspective of the crowd, the crowd has changed, a little more commercial there's a greater attraction to this music than before, that's also changing the playing field. I can work within all of those frameworks. I try to push the crowd, pull the crowd and give them something unique enough that is given a place within their memory and not just something filtered away." I asked Hawtin what would be the ideal setting to not only showcase his music but to articulate what he is trying to express as an artist. Hawtin: "The events that we do in the Windsor-Detroit area are probably the best to really understand what I'm doing and what I'm all about because there we take big warehouses or larger venues and transform them into something that exists only for that one night and that moment in time. I'm not just talking about flashing lights and a couple of hanging decorations, I'm talking about a full transformation. The perfect venue would be a venue with no identity itself so that I could fully bring in my own whether it's just a cinderblock building with the right infrastructure to make sure it's safe so that I could go all the way and recreate exactly what's in my head not only musically but also artistically and figuratively." Electronic music is developing at an exponential rate, the electronic music market is saturated with new releases and sounds. In fact it has never been a more daunting task to make sense out of this onslaught of sounds. Hawtin: "It goes through phases of popularity and you get times where one year you to the record store and get ten releases a week and other times you go and get fifty releases every couple of days. It sometimes gets over powering and overwhelming but I think it's positive really. As technology gets faster, doubles and becomes cheaper, it's accessibility gets closer to becoming more accessible to the masses. The more people who have the opportunity to use this technology become involved it gives us a chance to use some really interesting new innovations and ideas and in the end helps push our whole genre forward. That's why I recorded the new DE9 CD. I really think that with global internet, information is starting to become instantly accessible to nearly anyone at anyplace at any time, throughout the planet. Technology will come down the pipeline where it is available to the population, as music becomes digitized, it just becomes any other part of information flowing freely through the net. There won't be these white labels and these hard to find releases. Everybody will have these same kind of source material and it will be up to the DJ and producers to be filtering all of this digital information throughout the world and combining it, re-editing it, re-evaluating it in new ways to make it relevant again." When I inquired about what other types of music Hawtin listened to, he confessed that because of his position in the techno music scene that electronic music was in fact mostly what he listened to. On tour, he visits DJ record shops, looking for new releases. When Hawtin made it home from his global touring sojourns he lives with his brother in a former fire station converted to a living space and production studio. Hawtin's brother, a visual artist, likes to play classical music. So that is what he ends up listening to. Hawtin does appreciate other types of music including jazz, and happens to be a big Miles Davis fan. Hawtin: "Miles Davis was a big inspiration for Consumed. He was aware of music and space because he was aware that you didn't need to play everything you needed to hear because the brain fills in those gaps." A lot of the younger producers have been sporting the Hawtin hairstyle, jokingly referred to as the 'special' where one's head is shaved to a stubble. I asked Hawtin upon closing the interview if a 'House of Hawtin' did indeed exist--where did he go to get his flawless 'futurist' cut. Hawtin: The house of Hawtin is a place called the www.headblade.com. It's actually something I found three months ago, it's a blade that's curved for your head, it's the perfect way to shave your head. Sometimes I go to a guy in Windsor, Joe's Barber Shop who's been there since 1920 and chat with someone outside the scene and just have a half an hour break.